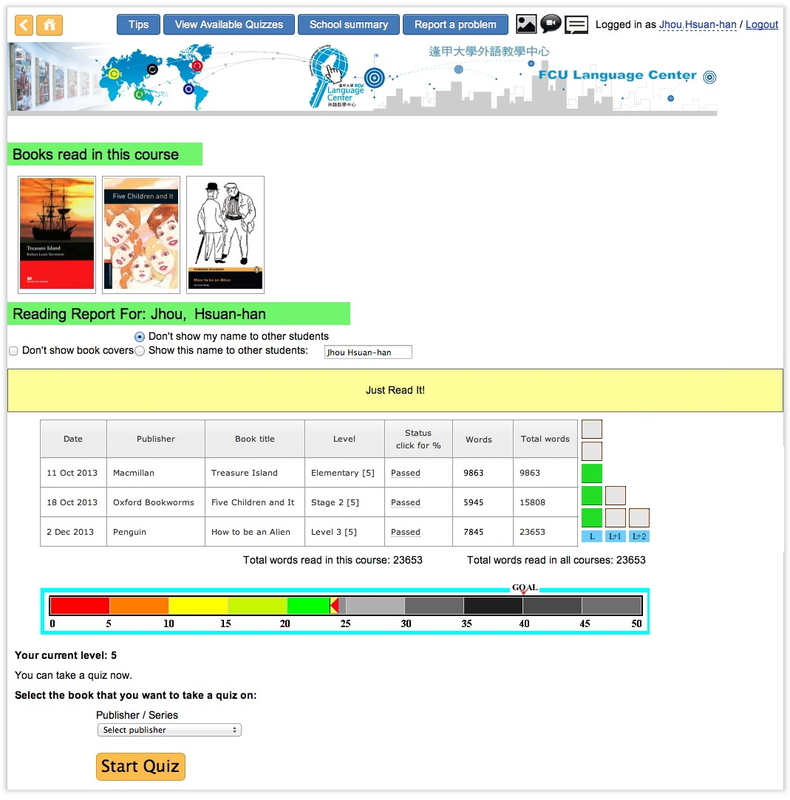 The Extensive Reading Foundation hosts the MReader.org site where students can take quizzes on more than 4000 graded readers and youth readers that are commonly used for Extensive Reading. Each quiz has 20 or more items from which the student receives a random selection of 10 questions. The site is available free of charge to any recognised educational institution. Students can be assigned a term-end word count goal, and then watch their progress on their own personal web page that displays the covers of book read, their current word count along with a colored progress bar. While not a substitute for the conscientious teacher with small classes who can personally track her/his students’ reading progress, it does allow the adoption of the Extensive Reading Approach in situations where it would otherwise be impractical. A Moodle plug-in version is also available. the approximate number of graded readers or other easy readers that you have available. Please send your initial contact from your official school email address since we need to verify that you are really a teacher, and not a student posing as one.